Ever wondered what it’s like to travel around the world finding the best talent for Cirque du Soleil? 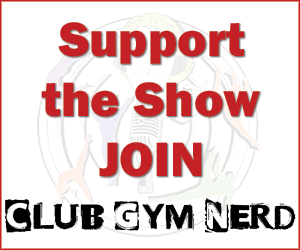 We sat down with talent scout, Marceline Goldstein to ask her all of our burning Gym Nerd questions: who is the oldest person she ever recruited, are there any injuries that preclude employment, how many years can a career at Cirque last, how does Cirque manage to not piss off federations who may want a competitor to stay in the sport, how they support the disciplines like acrobatics which is so essential to Cirque’s survival, is being able to hit at meets an essential prerequisite (you’ll be surprised), what kind of support system is in place for longevity and health. Our friend, Evan Heiter joins us once again to chat about the Mexican Open, which US Senior should go, who will win the Stuttgart World Cup, Octavian Bellu and Mariana Bitang‘s latest contract negotiation/vacation from Romania. Then in our new gymternet news segment, we speculate on Katelyn Ohashi‘s emphatic message; Nastia once again working with the great choreographer, Travis Wall; why comedian Michael Buckley and Evan should do Kiss & Cry interviews for gymnastics; and ponder important questions like – should men and women cross-compete on the same event (a la Paul Ruggeri on uneven bars) or should artistic gymnastics be done with their routines if they fall as is required in trampoline? All this, plus Danusia Francis‘s new dismount, Simone Biles yurchenko double back and Utah’s dramatic leotard reveal video. Tacky or genius? Next week, our guest will be Olympic Medalist, three-time NCAA champion at Alabama and current the athlete representative on the USA Gymnastics Team Selection Committee, Terin Humphrey. Corey Hartung from Florida also did the aerial sideays. Here is a video of Valeria Maksyuta of Israel doing yurchenko double back.